People with any sort of musculoskeletal pain. Physical therapy has been known to be very beneficial in the treatment of low back pain, and neck pain We frequently see individuals with work related injuries. Things like ankle sprains, knee sprains, shoulder injuries, wrist and hand injuries. 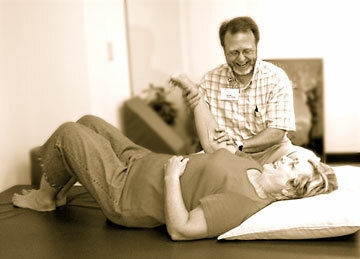 Individuals are helped by physical therapy after surgery, i.e. knee or hip replacement, lumbar or cervical surgery, total joint replacement, or even soft tissue surgery where scarring is a problem, and causing pain, or dysfunction. Physical therapy is also utilized in treating neurological conditions such as strokes, peripheral nerve injuries, multiple sclerosis , muscular dystrophy, Parkinson’s disease, or others. We also assist people with balance difficulties. If you have benign vertigo, there is often a procedure we can help with to reduce or eliminate your intermittent dizziness. It is called the cannalith repositioning procedure, and often requires only one session of P.T. Do you have headaches, or problems with TMJ? Physical therapists can often help with exercises, and posture to alleviate headaches, and improve alignment of the TMJ. We use cold laser and ultrasound to help with the acute pain. Have you been told that you have peripheral neuropathy? Many times individuals with such a diagnosis complain of burning and tingling in their legs, and may have weakness, and balance problems associated with it. At Integrity Therapy Group, we utilize ANODYNE (to help with the uncomfortable symptoms of peripheral neuropathy, and then apply balance activities to decrease stumbling episodes, and attempt to prevent falls.